In the burgeoning field of the “global” eighteenth-century, extensive work remains to be done on the experience of contact from Indigenous perspectives. Because the repression of such voices has been used as a colonial strategy, it is crucial that scholars of cultural contact and circulation attend to this problem. This essay is an intervention in perspectival shifts that operate at the confluence of place, materiality, and animal-human relations. It focuses on a few painted caribou-skin coats now in the Canadian Museum of History that belong to a corpus of well over a hundred examples created by Innu women starting around 1700 (Fig. 1). Shaped after the tailored silhouettes of the justaucorps worn by Frenchmen, the coats display dynamic geometric patterns painted mainly in vermilion, yellow, and blue. The patterns were generated by a process of visual translation, usually done by women painters, of the dreams of caribou hunters, usually men, into non-figurative forms. Once completed, the painted coats were considered to be active for one caribou hunting season, during which they consolidated the bond between humans and animals. Fig. 1. Innu culture, Painted Caribou-Skin Coat, probably late eighteenth century. Caribou skin, sinew, paint, 105 cm (length). Canadian Museum of History, Gatineau. III-B-642. © Photograph by author. The denomination of the Native group considered in this study has fluctuated over time. The Innu, an Algonkian-speaking group (not to be confused with the Inuit), live on Nitassinan, a vast subarctic land in the northeast peninsula of Quebec and interior Labrador. During the period when the painted caribou-skin coats were made, that is from the early eighteenth century to the third decade of the twentieth century, the Indigenous people who made them were identified as the Naskapi. The elusive group rose to prominence with the publication, in 1935, of Naskapi: The Savage Hunters of the Labrador Peninsula, an ethnographic study by Frank G. Speck. A student of Franz Boas, Speck based the book on his field notes from different stays in Naskapi territory, including transcriptions of his interviews with informants. This growth of scholarly interest, however, coincided with the disruption of cultural practices, such as the production of painted caribou-skin coats, a commonplace occurrence in the development of Native North American art. 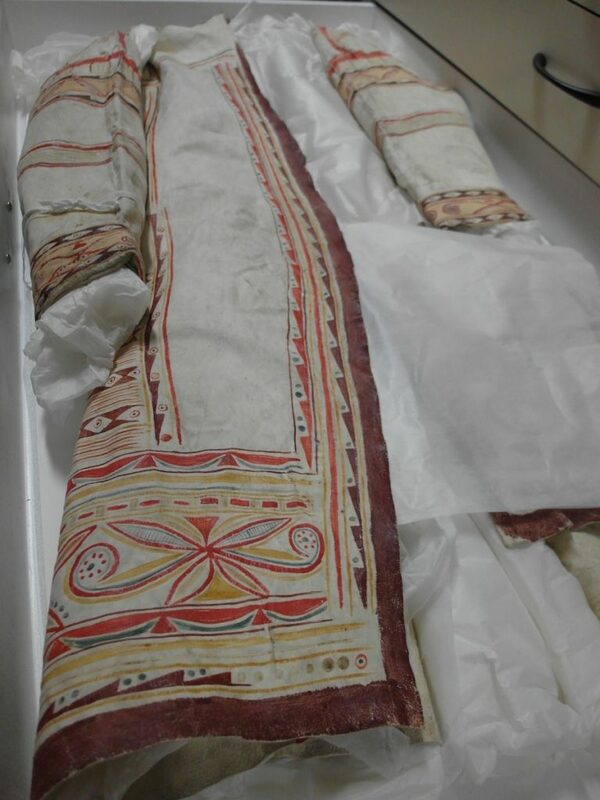 Building on the technical and historical analyses made by the late museum curator Dorothy K. Burnham of sixty coats, this paper returns to the caribou-skin coats painted by Innu women in order to evince their material intelligence. It also relies on Innu oral traditions, ethnographic texts, and recent scholarship on the temporalities of art history. Since the coats embody reciprocal relationships between husbands and wives, between humans and animals, and between Indigenous art and European fashion, they lend themselves to an alternative model of contact in which eighteenth-century Innu women played an active role. These wearable paintings on animal skin produced by a geographically isolated and culturally elusive group, however, pose numerous problems of documentation. Early descriptions by non-Natives of the Innu who moved inland deployed their lack of visibility as a trope of elusiveness. By the end of the eighteenth century, when the territory had changed hands from the French to the British following the 1763 Treaty of Paris which ended the Seven Years’ War, these textual descriptions of the Innu were also filled with racist observations. But non-Natives were not the only ones engaged in the act of looking. The Innu were looking at them too. From the inner landscape of dreams to the mobility of people and things in the Atlantic world, the painted caribou-skin coats arose as agents of interconnectedness. Methodologically, this study adopts a dialogical stance by implementing two ethical principles. The first attends to the materiality of the painted, wearable animal skins in relation to textual and oral sources, letting the creators of the coats and their descendants slowly emerge into the discourse of art history alongside the objects. The second is a small step toward the decolonization of methodologies by reflecting on the notion of place and by interweaving Innu and non-Native voices with scholarly ones. I am not an Indigenous scholar and do not, consequently, “write back.” By writing about the materiality of the coats that I have examined in the storage rooms of the Canadian Museum of History, I recognize their deep and enduring connection to the Innu land. Some remarks will be made about caribou skin and the fur trade in the eighteenth century, but the broader question of how non-Native collectors came to acquire the coats, many of them having landed in European museums, will not be addressed here. The reflections I present are meant instead to engage the coats as objects. They are also the first stage of a larger research project on the art of eighteenth-century Indigenous women in the northeast regions of Canada that will allow me to return to questions of hands and of circulation. I use the notion of elusiveness, which permeates the production, use, and mobility of the coats, to convert the dialogical stance of this paper into a point of contact between Innu and art-historical epistemologies. During 52 hours of interviews conducted in Innu-aimun with Kaniuekutat, an Innu hunter, before his death in 1994, Norwegian social anthropologist Georg Henriksen confronted the effects of elusiveness as a paradigm of Innu epistemology. Innu speech, Henriksen noted in I Dreamed of the Animals: The Life of an Innu Hunter (2009), is riddled with the word “maybe,” never allowing the non-Native researcher to settle into empirical certainty. Instead of stalling the production of knowledge, the repeated word enabled Henriksen to deal with the centrality of uncertainty to Innu epistemology, which he linked to the particularly unforeseeable natural environment of the peninsula. The caribou herds on which Innu subsistence relied, for instance, are notorious for their unpredictable migratory patterns, creating a dialectic of presence and absence. My contention is that the melancholic art history model propounded by Michael Ann Holly in The Melancholy Art is consonant with this Innu existential condition of uncertainty. As a discipline concerned with objects severed from their time and place of origin, Holly argued, art history carries a “quiet melancholic malaise.” This melancholic tradition of art history, which Holly traces back to the emergence of the discipline, renounces the primacy of positivism and accepts instead the internalization of the loss of origins as its main motivation. For melancholic art history deals with objects that remind us of the “cut between present and past, word and image.” It is this dynamic of loss that bridges the gap between these two intellectual traditions grounded in uncertainty and melancholy. One of the last painted caribou-skin coats to have been made during the twentieth century, which Burnham dated around 1926, was acquired by the National Museum of Denmark in 1928. In his 1944 study of the Labrador Peninsula, Finnish geographer Väinö Tanner expressed, under a photograph of the coat worn by a “dancing” mannequin, his confusion: “The ornaments are so skillfully elaborated that it is difficult to imagine they were originated in the Naskaupee’s present environment.” Tanner’s comment may be understood as a double bind: the coats have a European allure, yet they are materially and pictorially connected to a people that he had construed, in the text leading to this remark, as “primitive” and shielded from external influence. What I want to point out is how Tanner’s admission conveys the sheer quality of the coat as a fully realized work of art where decorative arts and painting coincide; this coat alone was enough evidence to upset the biases of his writing. Before Burnham’s technical analyses, which are grounded in history and anthropology, only Alika Podolinsky Webber had conducted copious but somewhat intimate archival and contextual research on the coats, the bulk of which was never published. It is with Burnham’s 1992 monograph that the coats emerged as objects of study. With a background as a textile scholar and curator, Burnham systematically measured the coats and analyzed their construction. Her breakthrough idea stemmed from an astute observation: “Cutting a coat shape from caribou skin makes no sense at all.” What Burnham meant was that it was more practical to use one caribou skin to make a pullover-like garment, rather than the three required to construct a coat with sleeves and a frontal opening. Burnham traced back the modification of the shape of caribou-skin coats, from a straight silhouette to a flared one, to the circulation of European garments in New France during the seventeenth century. She convincingly argued that Native people of the Quebec-Labrador Peninsula emulated, but only superficially, the shape of a hooded coat (capot) and then of the justaucorps, which had emerged as a military coat around 1670 and was commonly found in France through the mid-eighteenth century. Burnham’s argument about the construction of the painted caribou-skin coats deserves to be unpacked further as it indicates that the operation performed by the Innu women who absorbed the silhouette of Frenchmen into their garments was visual. The main evidence of the visual nature of the coats as objects of contact produced from an Indigenous perspective is the gusset, the triangular addition in the lower back that had been designed by French tailors to accommodate horseback riding. In its Innu iteration, the gusset is inserted without creating the full amplitude of the tailored justaucorps, as can be seen on the back of a coat dated c. 1770. Fig. 2. Innu culture, Painted Caribou-Skin Coat (detail), probably late eighteenth century. Caribou skin, sinew, paint, 105 cm (length). Canadian Museum of History, Gatineau. III-B-642. © Photograph by author. The visual proficiency of the Innu women painters who performed such a fundamental transformation, from the structural to the visual, is inherent to the skeuomorphic nature of the painted caribou-skin coats. For this act of transformation into the visual reverberates throughout the entire life cycle of the coats, from their associations with dream-formation to their activation as objects of interconnectedness with the caribou. The filling and delineating functions of lines oscillate between three main colors—yellow, vermilion, and blue—generating a dynamic visual experience. A detail of the lower right front panel of the coat shown in Fig. 1 demonstrates how irregularities were introduced to animate the design further (Fig. 2). The outer yellow volute on the right, for example, is cropped by the yellow framing line, suggesting that the pattern grows from the center of the coat to its edges. The number of red dots encircled by the two main volutes, furthermore, is uneven; this number fluctuates throughout the painted surface, with the addition, for example, of a ninth red dot in one of the four volutes of the collar (Fig. 3). 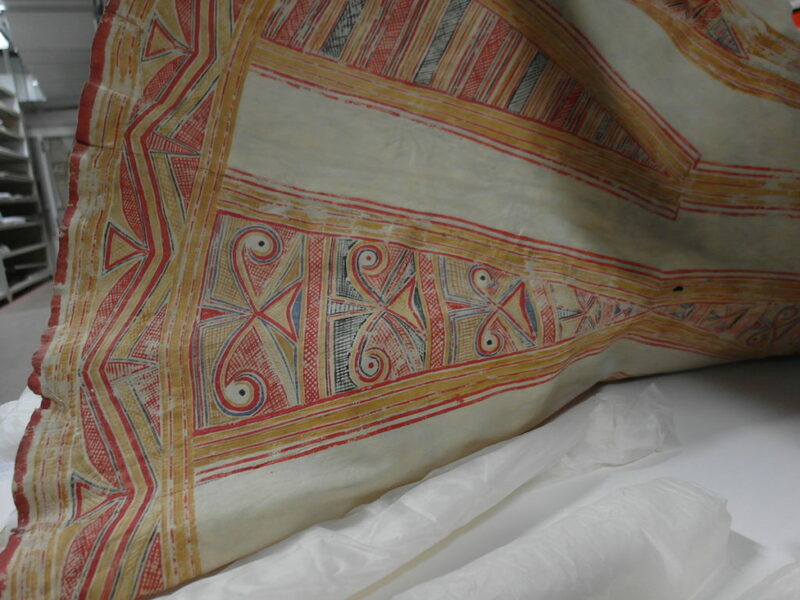 The geometric designs infilling the circumference of the gusset of one of the earliest coats, dated from the early eighteenth century by Burnham because of its flare, further exemplify the spatial flexibility and formal agility of the patterns developed by Innu women painters (Fig. 4). The long, organic volutes contract and dissolve into the rectangular ground as the gusset narrows toward a delicate tip that reflects a reciprocal but smaller shape marking the spine of the wearer. An aspect that has not been remarked on is how the responsive patterns painted on the caribou-skin coats shaped after European justaucorps play on the coats’ own structural lacunas. The physical folds of the justaucorps are turned, by iconicity, into visual approximations. The indexical skeuomorphism of the justaucorps, in other words, becomes iconic skeuomorphism in the Innu coats. It is this shift from indexicality to iconicity that inscribed, in the materiality of the coats, the gap between European and Innu garments. Fig. 3. Innu culture, Painted Caribou-Skin Coat (detail), probably late eighteenth century. Caribou skin, sinew, paint, 105 cm (length). Canadian Museum of History, Gatineau. III-B-642. © Photograph by author. Fig. 4. Innu culture, Painted Caribou-Skin Coat, probably early eighteenth century. Caribou skin, mammal sinew, paint, 105 cm (length). Canadian Museum of History, Gatineau. III-B-589. © Photograph by author. The painted marks also converted the tailoring marks of the justaucorps into sites of interconnectedness. The painting process registered, on the surface of the coats, different modes of transformation. The patterns of the coat seen in Figs. 1, 2, and 3, which was dated tentatively from the late eighteenth century by Burnham, are strikingly painterly. They are much less contained than in other eighteenth-century examples, and the paint application vibrates with a remarkable energy. This painterly technique was made possible by the medium, which was wet enough to create glazes with the tools, most of which were made of caribou antler and bone (Fig. 5). These tools made of caribou parts allowed the painters to press paint into the skin, creating shallow creases, a technique that combines an expressive application and a record of the pressure of the tools (Fig. 6). The painted surface, therefore, returns some indexicality to the coats by creating a physical memory of the painting tools and bodily pressure they serve to apply. By replacing the lost body of the justaucorps with that of Innu women and of caribous, the coats metabolized the dialectic of absence and presence. Fig. 5. Innu culture, Painting Stick, n.d. Caribou antler, 2.5 x 14.0 x 0.4 cm. Canadian Museum of History, Gatineau. III-B-235. © Photograph by author. The experience of early contact was also inscribed in the paint, an albumen-type binding medium developed by the Innu that bonds very well with prepared caribou skin. The pigments create a microcosm of the different modes of engagement with the products of trade. Laboratory analyses of the coat shown in Figs. 1, 2, and 3, for example, revealed a combination of endemic and synthetic pigments. The yellow protein was extracted locally, the Prussian blue was obtained through trade, and the red was a mix of local and foreign pigments. The yellow color, which comes from fish roe, tells an even more complex story of transformation, of flickering identities, that has fascinated non-Native scholars: this pigment tends to darken as its temperature changes, from when it is prepared to after it is applied, the design seemingly having a life of its own. Fig. 6. Innu culture, Painted Caribou-Skin Coat, probably early eighteenth century. Caribou skin, mammal sinew, paint, 105 cm (length). Canadian Museum of History, Gatineau. III-B-589. © Photograph by author. Unlike pigments, caribou skins were largely unaffected by trade during the eighteenth century. This lack of interest was reciprocal; in 1944, Tanner observed that the Innu did not seem “to care” about the fur trade. In the eighteenth century, many trading posts established on the coast did not even include caribou skin in their records. The problem, from a trader’s perspective, was that the caribou was crawling with warble fly larvae that riddled its skin. In 1792, George Cartwright observed that caribou skin was very apt for the climate of the peninsula, but that it had little commercial appeal: “The skin of the Rein-Deer (sic) makes the finest leather of any, but, as there is not one in a thousand which is not full of Warble-holes, or the eschars left by those which are healed up, they are not worth sending to Market. It is therefore the best way, to use them in the Country, where they will be found of great use for many purposes.” The holes described by Cartwright, which are visible in figure 4, made the desirability of caribou skins fluctuate throughout the year, following the life cycle of the warble fly larva. Disposed to having punctures, caribou skin remained bound to the land that had generated it, moving in a closed circuit. Oddly enough, larvae contributed to isolate the Innu further by defending their primary resource from the effects of commercial trade. It was during the 1730s that the term “Naskapi” began to be applied to the elusive bands living in the northeast peninsula that rarely visited the trade posts established by the French on the coast. The first use of the term was traced to the Jesuit missionary André Richard, who introduced it in the Jesuit Relations of 1643 as a francization of Ounachkapiouek’, which translates roughly as “people from where things disappear.” When the inland bands entered European consciousness, in other words, they were already associated with a condition of perpetual disappearance. Induced by the northern insularity and semi-nomadism of the Naskapi (what anthropologist José Mailhot called their “structured mobility”), this condition became a trope of non-Indigenous sources, rendering the Innu—and Innu women in particular—barely visible figures in the study of eighteenth-century contact. As the term Naskapi acquired more negative connotations toward the end of the eighteenth century, isolation gained ideological ramifications, casting the Naskapi as a wilder and more unruly group than the Inuit. Tanner emphasized that the Naskapi were still reluctant, by the mid-twentieth century, to approach the coast, which they avoided for fear of contagion. If I were to ask you to imagine, based solely on European textual sources, what the world was like for a Naskapi woman in 1700, you might feel yourself vanish in the white immensity of the abstract North. In the interior between Ungava Bay and Hudson’s Bay is a distant country where no Indians will go under any considerations for the following reason. There is a range of big mountains pure white in color formed neither of snow, ice, nor white rock, but of caribou hair. They are shaped like a house and so they are known as Caribou House (ati’k wədzwa’p). […] In this enormous cavity live thousands upon thousands of caribou under the overlordship of a human being who is white and dressed in black. Some say there are several of them and they have beards. He is master of the caribou and will not permit anyone to come within some one hundred and fifty miles of his abode, the punishment being death. The tale, as reported by Speck, shows how the expanse of the interior regions was conducive to storytelling. Non-Native visitors who were contemporaries of Bellefleure remarked on the myth-making nature of the place as well. In the late 1920s, for example, ethnographer William Duncan Strong wrote about the effects that remoteness and inaccessibility had on the experience of the land: “Such lifelessness in such a desolate and vast country is impossible to describe and it must have a direct effect upon the imagination of the Indian who is constantly exposed to it.” For non-Native explorers, the inland territory inhibited language; for the Innu, it stimulated it. The idea of disappearance is inscribed in the Innu oral tradition recorded a century ago not as a symptom of cultural extinction, but rather as a space of identity formation. Until the Quebec government started to covet the remote land for its enormous hydroelectric potential, it seemed that, indeed, no one wanted to venture into the Caribou House. Starting in the late 1960s, however, the government actualized the myth of disappearance by blindsiding the Innu and wrecking some of their hunting lands. Twenty-seven reservoirs were created and nineteen rivers were redirected for the colossal James Bay hydroelectric project, flooding thousands of square kilometers of Naskapi territory. The environmental consequences were catastrophic, from mercury contamination to the inversion of the flow of many rivers. As a child, I knew that the hydroelectricity powering my house came from the James Bay. It was one of the great narratives of inland colonialism taught in French Canadian history classes. But no one talked about the caribou. As water spilled over and its level rose, thousands of caribou—who had been relentlessly moving across the land since the Paleolithic era—drowned. Bodies in water are always present in one’s mind when living in the North: frozen, the surfaces of lakes and rivers turn into shortcuts and open pathways. But this layer of ice can also give in and crack if its thickness is not estimated accurately, releasing a fatal trap. It was common for Innu hunters to die in this way. Marie Louise, a Naskapi woman who was described to Speck as a fierce hunter, was one of them. Still a prolific huntress in her nineties, she was on her way to the land of the caribou when the ice broke under the weight of her body, and the cold water swallowed her. The caribou hunting techniques developed by the Innu were well structured. Even Tanner suspended his patronizing tone—a euphemism for the racial violence of his text—when he discussed the hunting techniques of the Naskapi. Like other non-Native explorers of the early twentieth century, he expressed an absolute admiration for the hunting skills of the Innu. They were, he claimed, the “most systematic” he had ever encountered. This sophistication is related to the centrality of the caribou in the spiritual and material life of the Innu. During the eighteenth century, life in the northeast peninsula of Quebec and Labrador depended almost entirely on the caribou (Rangifer tarandus). It had been hunted since the Paleolithic era by the ancestors of the Innu for whom it constituted the main source of food, clothing, and tools, “a veritable Paleolithic cornucopia.” The caribou, however, is a nomadic animal with unpredictable patterns of circulation and dramatic variations in herd size, subjecting the Innu to the immense pressure of its desired presence and haunting absence. For Innu hunters, the caribou was the elusive one. “It was the caribou that absorbed their thoughts,” Tanner wrote. In the Innu nation, as in other subarctic and arctic groups, relationships to animals are characterized by a form of interconnectedness that tends to give the advantage to the non-human animal. The Innu respected the caribou and developed a material culture designed to seal the establishment and continuation of reciprocal relations. As Henriksen noted, Innu myths, which tell stories about a distant past as well as tales about recent events, are often concerned with the crossing of boundaries between humans and animals, reflecting a deep animism. When I was a child I was taught to respect the Utinimatsheshu Caribou Spirit, the Giver of Food. Children were not allowed to make fun of animals or Utinimatsheshu would get angry. We were taught how to respect the spirits. I was told if I made noise outside, Utinimatsheshu would not share the animals with us. The animals were our food. We were not allowed to be negative toward our parents, like nagging at them or getting angry. The other important thing was to be careful about what we said to the hunter. We had to respect the hunter. This is what we learned. We survived by what we learned. In the expanse of the barrens, children were asked to be quiet so as not to displease the caribou. Kaniuekutat also attributed the success of a shot fired at the animal to the will of the caribou spirit (Katipenimitak); to kill a caribou is a “gift” from animals. The elders, Kaniuekutat continued, believed that caribous could always see hunters as they approached, if not with their eyes, then with their anuses and tails, which had the liberty to alert the caribous—or not—of the arrival of intruders. The game is elusive, the children are quiet, the tail is watching, the spirit has the last word. She convinced him. They slept together, lived as husband and wife, and had a baby. Their marital happiness ended in a dramatic episode during which Kauitatikumat killed his father-in-law, an old caribou whom he had not recognized. The myth is full of such moments of misrecognition. The boy who married a she-caribou sometimes sees his wife as a human, other times as an animal. “He felt no different than he had before as a human being,” Kaniuekutat added. This oscillation of the self-identification process, which never seems to ossify, is conveyed by the painted caribou-skin coats. They establish a bond with the caribou through and through, but they also make the Innu wearers look like the European men doing business on the coast. The coats make the wearer flicker. They allow misrecognition. To be Innu, European, caribou. The painted caribou-skin coats are entangled further in such experiences of misrecognition, their actual substance occasionally metamorphosing into a womb. “You will feel just the way you feel when you are inside the tent,” said the caribou girl to Kauitatikumat about marrying her. In another version of the myth, she insisted that “the caribou would take care of him and be like a tent for him.” These reassuring remarks about crossing over the human-animal divide evoke one of the most important spiritual practices of the Innu, which they share with many neighboring nations: the shaking tent ceremony. Famous but secretive, it is performed by a shaman who steps inside an ogival structure barely large enough to accommodate a body. The tent is nestled in a space from which an audience can watch as drumming and signing announce the visit of spirits. The walls of the shaking tent are lined with female caribou skins, which prompted Henriksen, crediting Australian anthropologist Bruce Kapferer for the idea, to remark that it is like a womb. As a sort of uterine wall where human and animal spirits come into contact, caribou skin becomes a different organ altogether. More than a protective barrier, it is a milieu conducive to interconnectedness. Rather than aspiring to restore the historical origins of the coats, I have proposed to read their materiality as milieus where Innu women processed complex interactions between an uncertain natural environment and fluctuating identities. The contribution of melancholic art history to the study of the coats resides in its ability to turn their irremediable loss of origins into a method that nourishes the Innu notion of elusiveness. It allows art-historical writing to remain open enough to invite members of the Innu groups who honor and protect Nitassinan to weave themselves into its verbal fabric. The coats also look at art history. They make demands on its methods, notably by requiring the examination of the relation between materiality and theory extricated from history. Their contribution to the discipline has also been buttressed by the recent emergence of a “non-modern model” that renounces the ascendancy of Western chronology and teleology. They seem to offer a model of interconnectedness that keeps the wounds of colonial violence open as well. By making incisions in the flesh of academic writing, the painted caribou-skin coats invite us to feel the haunting absence of the elusive caribou as we await its return. Felicity A. Nussbaum, “Introduction,” in The Global Eighteenth Century, ed. Nussbaum (Baltimore: John Hopkins University Press, 2003), 1-18. Linda Tuhiwai Smith, Decolonizing Methodologies, 2nd ed. (London: Zed Books, 2012); Alyssa Mt. Pleasant, Caroline Wigginton, and Kelly Wisecup, “Materials and Methods in Native American and Indigenous Studies: Completing the Turn,” The William and Mary Quarterly 75:2 (2018), 207-236. Because of the nomadism of the Innu and of the caribou of the barrens during the eighteenth century, I use the notion of place in a more diffuse way than David Summers. See his “Places,” in Real Spaces: World Art History and the Rise of Western Modernism (London: Phaidon, 2003),117-200. Innu is the denomination preferred by members of the Native groups it encompasses, which includes groups formerly known as the Naskapi and the Montagnais. The Montagnais territory is southeast of that of the Naskapi. Dorothy Burnham, To Please the Caribou: Painted Caribou-Skin Coats Worn by the Naskapi, Montagnais, and Cree Hunters of the Quebec-Labrador Peninsula, with a foreword by Adrian Tanner (Seattle: University of Washington Press, 1992). For recent responses to the teleological model of art history that emerged in the late nineteenth century, see Dan Karlhomm and Keith Moxey, eds., Time in the History of Art: Temporality, Chronology, and Anachrony (New York: Routledge, 2018). For a concise and helpful review of the methodological shifts of art history following the emergence of the agency of objects in the discipline, see Veerle Thielemans, “Beyond Visuality: Review on Materiality and Affect,” Perspective [Online] 2 (2015). Because of the preliminary nature of the present findings and their focus on questions of materiality, a dialogue with members of Innu groups has not yet been integrated into the text, but it will in the next stage of my broader research project on the art of Native women during the eighteenth century. On “writing back” as a methodological strategy of decolonization for Indigenous researchers, see Smith, Decolonizing Methodologies, 1-18. This project is motivated, in part, by my own contact, through my father, with Native hunting techniques in Saguenay, on the land of the Montagnais, south of Nitassinan. Like many French Canadians, I grew up in a white family where veiled mentions of the transmission of Indigenous hunting techniques, and of certain Indigenous physical traits shared by my relatives, was sometimes evoked, usually in problematic ways, but never discussed openly. Burnham included the fragmentary records on the coats’ provenance in her catalogue. Georg Henriksen, I Dreamed the Animals: Kaniuekutat: The Life of an Innu Hunter (New York: Berghahn Books, 2009), 3. Michael Ann Holly, The Melancholy Art (Princeton: Princeton University Press, 2013), 98. Holly, The Melancholy Art, 116. Burnham, To Please the Caribou, 297. Väinö Tanner, “Outlines of the Geography, Life and Customs of Newfoundland-Labrador (The Eastern Part of the Labrador Peninsula),” Acta Geographica 8:1 (1944), 692. Most of the research made by Alika Podolinsky Webber was unpublished. Her archives, which were acquired by the Canadian Museum of History, will soon become entirely available. Burnham, To Please the Caribou, 5. On the history of the justaucorps, see François Boucher, Histoire du costume en Occident (Paris:Flammarion, 2008), 215-228. The interpretation of deliberate errors is a significant but complicated question that deserves further investigation with members of the Innu nation. In other native North American contexts, similar errors have been interpreted as signals of duplication to demarcate a copy from a powerful object, or as indexes of the maker’s imperfect humanity. On the indexicality and iconicity of skeuomorphs, see Carl Knappett, “Photographs, Skeuomorphs and Marionettes,” Journal of Material Culture 7:1 (2002), 108-110. Elizabeth A. Moffatt, P. Jane Sirois, and Judi Miller, “Analysis of the Paints on a Selection of Naskapi Artifacts in Ethnographic Collections,” Studies in Conservation 42:2 (1997), 65-73. Moffatt, Sirois, and Miller, “Analysis of the Paints,” 68. Burnham, To Please the Caribou, 37; Moffatt, Sirois, and Miller, “Analysis of the Paints,” 71-72. Tanner, “Outlines of the Geography,” 667. Daniel Castonguay, “L’exploitation du loup-marin et son incidence sur l’occupation de la côte par les Montagnais de la Traite de Tadoussac, au XVIIIe siècle,” Recherches amérindiennes au Québec XXXIII:1 (2003), 61-72. George Cartwright, George Cartwright’s The Labrador Companion, ed. Marianne P. Stopp (Montreal: McGill-Queen’s University Press, 2016), 253. Ernest S. Burch, Jr. “The Caribou/Wild Reindeer as a Human Resource,” American Antiquity, 37:3 (July 1972), 343. Steven Connor, The Book of Skin (London: Reaktion, 2004), 29. Tanner, “Outlines of the Geography,” 659-661. William B. Cabot, introduction to A Woman’s Way Through Unknown Labrador: An Account of the Exploration of the Nascaupee and George Rivers, by Mina Benson Hubbard, ed. Sherrill Grace (Montreal: McGill-Queen’s University Press, 2004), 1. Mary Jane Pasteen, “Women Speared the Caribou,” in It’s Like the Legend: Innu Women’s Voices, ed. Nympha Byrne and Camille Fouillard (Charlottetown, PEI: Gynergy Books, 2000), 35. Tanner, “Outlines of the Geography,” 671. José Mailhot, “La disparition des Oumamiois et des Kichestigaux: une histoire cousue de fil blanc,” Recherches amérindiennes au Québec 34:1 (2004), 28-29. A Parcel of Fools: Economic Development and the Naskapis of Quebec; A Report Submitted to the Native Economic Development Programme by the Naskapi Development Corporation, compiled and written by Paul F. Wilkinson and Denise Geoffroy (August 1989), 21. Stephen Loring noted that Innu women, whose work was essential to survival, are practically absent from the “Paleoindian literature.” See his “On the Trail to the Caribou House: Some Reflections on Innu Caribou Hunters in Northern Ntessinan (Labrador),” in Caribou and Reindeer Hunters of the Northern Hemisphere, ed. Lawrence J. Jackson and Paul T. Thacker (Aldershot: Avebury, 1997), 199. On the idea of “structured mobility,” see José Mailhot, “La mobilité territoriale chez les Montagnais-Naskapis du Labrador,” Recherches amérindiennes au Québec 15:3 (1985), 8. Peter Armitage, The Innu (The Montagnais-Naskapi) (New York: Chelsea House Publishers, 1991), 14; Stephen Hay, “How to Win Friends and Trade with People: Southern Inuit, George Cartwright, and Labrador Households, 1763 to 1809,” Acadiensis 46:2 (2017), 42. Tanner, “Outlines of the Geography,” 663. Edward S. Curtis’s 20-volume photographic essay The North American Indian: Being a Series of Volumes Picturing and Describing the Indians of the United States, and Alaska (1907 to 1930), for example, has been argued to align, at first, with the American assimilationist movement. On this question, see Shannon Egan, “‘Yet in a Primitive Condition’: Edward S. Curtis’s North American Indian,” American Art 20:3 (Fall 2006), 58-83. Since Allan Sekula’s seminal study of the political function of documentary photography, it is not possible to ever evacuate colonial ideology from the premise of Curtis’s project, namely that Native people were on the brink of disappearance. See Sekula, “Dismantling Modernism, Reinventing Documentary (Notes on the Politics of Representation),” The Massachusetts Review 19:4 (1978), 859-883. Alexander Bellefleure, cited in Frank C. Speck, Naskapi: The Savage Hunters of the Labrador Peninsula (Norman: University of Oklahoma Press, 1977), 82. Eleanor B. Leacock and Nan A. Rothschild, eds., Labrador Winter: The Ethnographic Journals of William Duncan Strong, 1927-1928 (Washington: Smithsonian Institution Press, 1994), 6. J. I. Linton, “Guest Editorial: The James Bay Hydroelectric Project — Issue of the Century,” Arctic 44:3 (1991), iii-iv; Paul Charest, “More Dams for Nitassinan: New Business Partnerships between Hydro-Quebec and Innu Communities,” in Power Struggles: Hydro Development and First Nations in Manitoba and Quebec, ed. Thibault Martin and Steven M. Hoffman (Winnipeg: University of Manitoba Press, 2008), 255-279. Theodore Brasser, Native American Clothing: An Illustrated History (Buffalo: Firefly Books, 2009), 94. Tanner, “Outlines of the Geography,” 670. Stephen Loring, “On the Trail to the Caribou House: Some Reflections on Innu Caribou Hunters in Northern Ntessinan (Labrador),” in Caribou and Reindeer Hunters of the Northern Hemisphere, ed. Lawrence J. Jackson and Paul T. Thacker (Aldershot: Avebury, 1997), 188. Loring, “On the Trail to the Caribou House,” 189-192; William Duncan Strong, “Notes on Mammals of the Labrador Interior,” Journal of Mammalogy 11:1 (1930), 1. Janet Catherine Berlo and Ruth B. Phillips, in their seminal survey of Native art, encapsulate the relations of Arctic and Subarctic nations to animals with the ideas of reciprocity and respect. See their Native North American Art, 2nd ed. (New York: Oxford University Press, 2015), 165. Henriksen, I Dreamed the Animals, 25-26. The term “spirit” is used in anthropology to translate more complex Innu concepts. See Henriksen, I Dreamed the Animals, 5. Henriksen, I Dreamed the Animals, 54, 111. Henriksen, I Dreamed the Animals, 55. Robert Brightman, Grateful Prey: Rock Cree Human-Animal Relationships (Berkeley: University of California Press, 1993), 76-91. Kaniuekutat cited in Henriksen, I Dreamed the Animals, 37. Kaniuekutat cited in Henriksen, I Dreamed the Animals, 43-52. What I have in mind is the concept of misrecognition as developed by Jacques Lacan in his description of the mirror stage. Kaniuekutat cited in Henriksen, I Dreamed the Animals, 43. Leacock and Rothschild, eds., Labrador Winter, 165. Henriksen, I Dreamed the Animals, 23. Connor, The Book of Skin, 26-29. The idea of skin as a milieu was developed by Michel Serres. Because they command theory and provide the tools to produce it, the painted caribou-skin coats emerge as “theoretical objects.” See Yve-Alain Bois, Denis Hollier, Rosalind Krauss, and Hubert Damisch, “A Conversation with Hubert Damisch,” October 85 (Summer 1998), 3-17. Dan Karlholm, “Is History to Be Closed, Saved, or Restarted? Considering Efficient Art History,” in Time in the History of Art: Temporality, Chronology, and Anachrony, ed. Dan Karlhomm and Keith Moxey (New York: Routledge, 2018), 14. Holly’s concept of melancholy is overdetermined, but it aligns with the distinction Sigmund Freud made, in Mourning and Melancholia (1917), between a grieving process stemming from an actual loss and an internalized and unresolvable feeling of loss. I am adding a postcolonial layer to the concept. 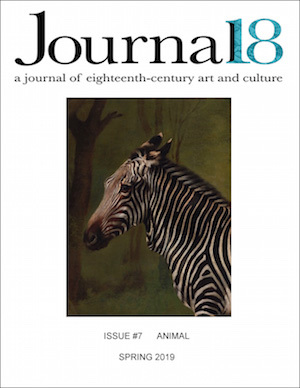 Cite this as: Catherine Girard, “Innu Painted Caribou-Skin Coats, and Other Tales of Elusiveness,” Journal18, Issue 7 Animals (Spring 2019), http://www.journal18.org/3498.